Tired of a raw, red nose and dry, scratchy throat? Figure out the cause now, so you know how to treat it! As the snow melts and the last bit of chill leaves the air, we are met with a spattering of the signs of spring. Most of them are welcome, but not all! 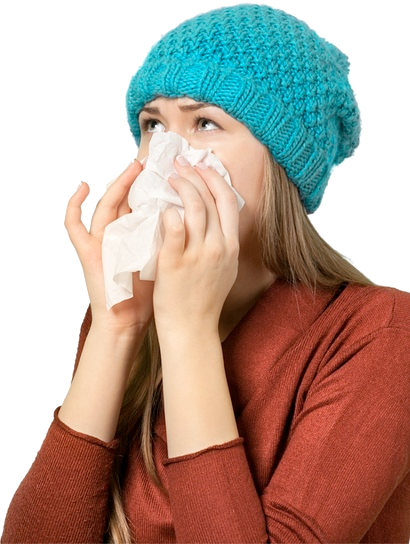 All too often during this time of year, people suffer from common immune irritations including sneezing, runny nose, and itchy eyes. But with cold weather just barely behind us, it’s hard to know whether these symptoms are the result of a common cold or seasonal allergies. If you’re wondering how to tell if you have allergies or a cold, you’re not alone. According to Medical Daily, more than 50 million Americans suffer from environmental allergies and over one billion people deal with at least one cold each year. It could be either, so which is it for you? While there are some common symptoms shared between the two, there is an easy way to tell the difference between a common cold and allergies. Any of these symptoms can easily occur if you’re struggling with both allergies or a cold, so if you’re wanting to know how to tell if you have allergies, look at the following symptoms before you decide which one it may be. If you’ve never had allergies until now and you’re confused about the sudden onset, these symptoms should give you a clear picture of which irritation you are experiencing, a cold or allergies. One of the biggest and easiest determining factors is the duration of the symptoms. A cold will rarely last longer than a couple weeks. If your symptoms are persisting after a month and you’re still not sure how to tell if you have allergies, it may be time to consider seeing an allergen specialist. These trained professionals are able to run diagnostic tests on the exact source of your allergic reactions to better prepare you to deal with them properly. Many allergic reactions can also improve by changing some lifestyle choices. Diet and nutrition can be a key contributing factor to the health of your auto-immune responses. Wellworks For You offers more great tips on improving diet and lifestyle choices. Check out our blog for more information or call us today at 800.425.4657 to see what wellness programs we offer.